I don't know about you, but whenever I make deviled eggs, for my family or a gathering, the ooh-ing and aah-ing just won't quit. Maybe it's the eggs from pasture-raised chickens with their marigold yolks—I've been accused of using turmeric to amp up their color—but they invariably disappear without a trace. Here's a pro tip: use my tried-and-true, easy-peel method to hard-boil those fresh-from-the-farm eggs. And another tip: if you don't have one of those deviled egg platters like the one in the top photo, slice lettuce or other greens into chiffonade and spread them over a plate (photo, left). The eggs sit up like champs! Hard-boil eggs using my method. Halve hard-boiled eggs, removing yolks and putting them in a small mixing bowl and placing whites on serving tray. Mash yolks with fork until there are no lumps. Add mustard and mayonnaise and combine, stir well until smooth, adjusting mayonnaise to taste (you don't want it too dry or too creamy). Fill halves of whites with yolk mixture. Place a fine sieve over a small bowl and add paprika. Carefully lift the sieve about 10" above the eggs and tap the edge to gently shower them with a dusting of the paprika. Serve. Hard-boil eggs using my method. Halve eggs, putting yolks in small mixing bowl and placing whites on serving tray. Using long-tined fork, crush yolks until thoroughly mashed. Add anchovy fillets and mash into yolks. Chop six of the olives finely and add, with mayonnaise and pinch of paprika, to egg yolk mixture. Mix thoroughly. Fill whites with egg mixture and arrange on platter. Slice each remaining olive crosswise into four rounds and top each egg with one, then put a small bit of the harissa on top of the olive. Put another pinch of smoked paprika into small mesh sieve and, tapping lightly, sprinkle platter with paprika. Serve. Hard-boil eggs using my method. When cool, halve hard-boiled eggs, removing yolks and placing them in a small mixing bowl and placing whites on a serving platter. Mash yolks with fork. Add curry powder, mustard, oil and mayonnaise and combine, stirring until there are no lumps. Fill halves of whites with yolk mixture. In frying pan, heat oil until it shimmers but doesn't smoke (I always flick a few drops of water into the oil…when it spatters it's hot enough). Add sage leaves, a few at a time, and fry for a few seconds on each side. Like making crostini in the broiler, the key is to not turn away because they'll burn the instant you do. So stand there and wait. Remove to paper towel to drain and cool. 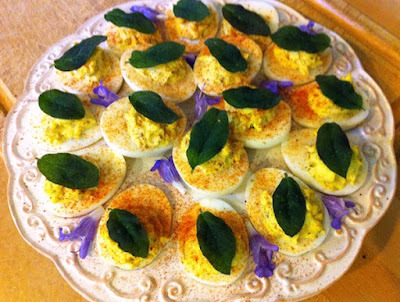 Sprinkle eggs with pimenton (see method, above), top each with a sage leaf and scatter sage flowers on the platter. In small skillet over medium-high heat, cook chorizo slices until crispy. Remove to paper towel to drain. When cool, halve and reserve. Hard-boil eggs using my method. Halve hard-boiled eggs, removing yolks and putting them in a small mixing bowl and placing whites on serving tray. Mash yolks with fork until there are no lumps. Add mustard, finely grated horseradish and mayonnaise and combine, stirring well until smooth, adjusting horseradish to taste (it can vary in strength and heat depending on where it's from, how old it is, etc., so start light and adjust). Fill halves of whites with yolk mixture. Top each egg with a half slice of chorizo. * Spanish-style chorizo is a salami-like cured product. If you can't find authentic Spanish chorizo, Fra' Mani makes a Salametto Piccante, or you can use Olympia Provisions' chorizo. 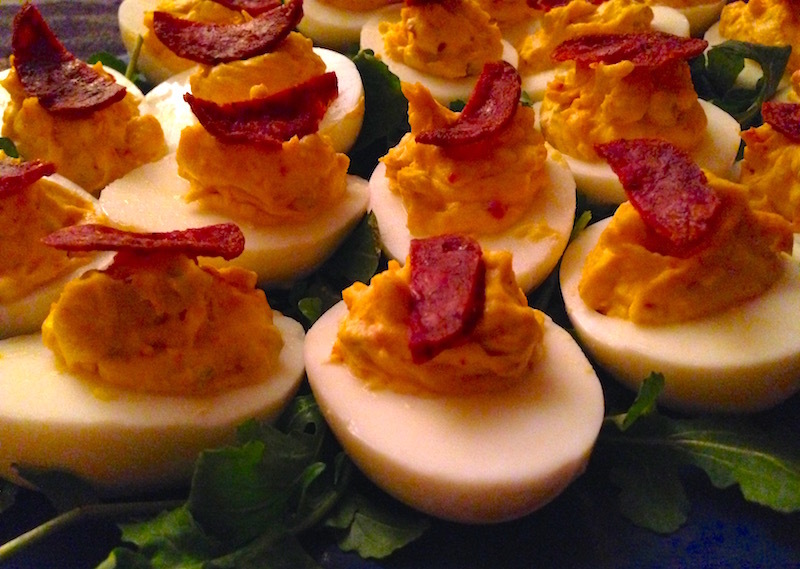 Your deviled eggs sound delightful! But there is one ingredient missing: butter. (Now, I got this from my mother...) Adding some butter along with the mayonnaise creates great texture. When the deviled eggs are chilled, the filling is firm and silky, not loose, and the flavor is just a bit enhanced. Doesn't have to be much butter (and it should be room temp for mixing) but it really makes a difference. Wow! Now that's a new one on me, Mary. I'll definitely give it a try on the next batch!